Paul G. Harris (ed. 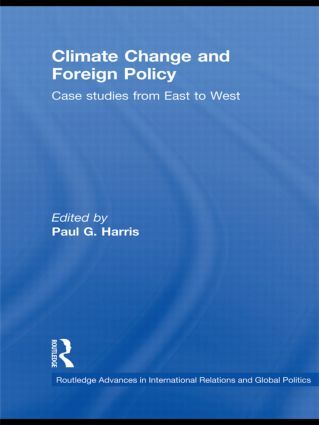 ), Climate Change and Foreign Policy: Case Studies from East to West (Routledge, 2009). Climate Change and Foreign Policy: Case Studies from East to West and its companion volume, Environmental Change and Foreign Policy: Theory and Practice, examine and explain the role of foreign policy politics, processes and institutions in efforts to protect the environment and natural resources. They seek to highlight international efforts to address human-induced changes to the natural environment, analyze the actors and institutions that constrain and shape actions on environmental issues, show how environmental changes influence foreign policy processes, and critically assess environmental foreign policies. Climate Change and Foreign Policy examines the problem of global climate change and assesses the manner in which governments and other actors have attempted to deal with it. It presents a series of in-depth international case studies on climate policy in Australia, Japan, China, Turkey, Hungary, Denmark, France, the European Union and the United States. The authors demonstrate how studying environmental foreign policy can help us to better understand how governments, businesses and civil society actors address – or fail to address – the critical problem climate change. Climate Change and Foreign Policy will be of interest to scholars and students of environmental policy and politics, foreign policy, public policy, climate change and international relations.